My question is how big a change is the 63s to a newer pair of the 7s. Local friend looking to sell his 7 for $1350 which seems like a great deal. I like that my current setup has all matching size woofers not sure if that matters at all. So is it a significant difference and how is the price? Roughly 50/50 ht and music. I've owned the RF-83 and RF-7ii at the same time. The 83's have a more laid back sound while the RF-7ii is a tad brighter but definitely not too bright or ear fatiguing. The 7ii's will have a "bigger" sound, more bass. When I add 2 subs to the mix is the bass or quality from the 7s even noticeable or worth the cost difference? I've never had the 63's, but from what I've heard on many occasions they are fantastic speakers. I do love my 7 II's, they sound great for movies and music. Will the the 7 II's be a big upgrade? Hard to say unless you have them side by side. But the fact you already have the matching set for the 63's, I would personally be hard pressed to mess with your current setup. I would say focus on getting your DIY subs going, I think that would be the biggest impact for your system. Ok, let me get this out in the open. I am a bit biased towards the RF-63's. I love them. For music, they are tough to beat in the Reference lineup, both past Reference and present. As a matter of fact, I think they hold their own musically verses Klipsch 3-way designs(KLF's, extended Heritage). As far as movies go, the RF-7II's will have a bit more "bigger" sound. If blended properly, it will not be a huge difference between the two. The RF7II's do have the edge in overall presence but the RF-63's midrange, IMO will rival some of the best 2-way designs you can buy at or even above it's price point. I would imagine your subs doing most of the work, so the added bass from the 7's probably wouldn't be worth the price IMO. I've heard both and I'd keep the 63's every day of the week. Even if they were a straight up trade with no money involved I'd still keep the 63's. I miss my 63's and am currently looking for a pair to use in a spare bedroom. Wanting to figure out selling some cornwalls if I find a pair of 63's. Just for another perspective, although the RF63's sound great, I wouldn't sell or trade my RF7ii for RF63's.. Both are fantastic speakers. I'd love to hear some 63's some day, maybe do a side by side with the RF-5's. I am thoroughly impressed with the 5's and never thought I would be having owned several pair of the 3's. I imagine the room and placement and such will have a dramatic effect on how well they perform and will obviously vary person to person. I'm not sure the RF-5's would have held up in my old room where the Chorus II's lived, not many speakers sounded very good in there and it took a whole of equipment changes to get the sound I was after with the Chorus II's. $1350 seems reasonable for the 7 II's. If he's a good "friend," maybe he'll let you try them out at your place? Never hurts to ask. 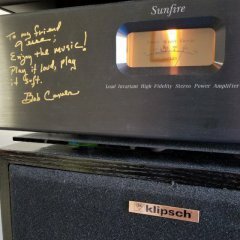 While owning RF-7's and RF-83's, I bought a pair of RF-5's out of curiosity as everyone seems to love them. 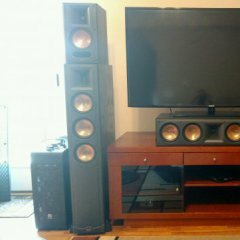 They were ok. Not enough bottom end for my large open room without a sub. If he's a good "friend," maybe he'll let you try them out at your place? Never hurts to ask. That's a great idea. They do it at the car dealerships. If subs are used, no real advantage in the bass department between the 63's and 7 II's. As youthman said a bit more presence due to the larger horn but, th 63's are not missing anything on their own. Keep what you have and get the subs done.